Cyclists are being asked to dismount as they travel down the side of York Minster for 10 weeks from 28th January, 2013. 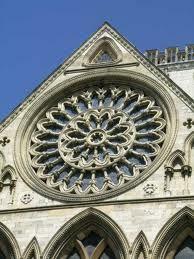 As you push your bike past the south entrance, you might like to look up to the Rose Window which commemorates the marriage of Henry Tudor (Lancastrian King) to Elizabeth of York,1486 and marks the end of the War of the Roses. The Tudor rose combines the Lancastrian and Yorkist roses. Take extra care just after the Minster to look for the sign which turns you right just before you go under Monkgate Bar. Or, try to remember, 'second right after the Minster'!